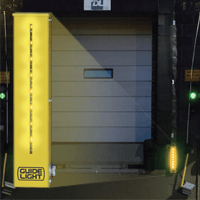 • Complete illumination: The LED Versa light is the only dock light on the market that is specifically designed to fully illuminate the backside of a 53′ trailer. 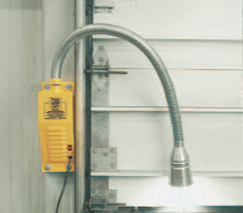 • Improve worker safety and productivity: Low voltage LED Versa light protects workers from exposure to sparks and shocks and offers twice the amount of light than competitors. 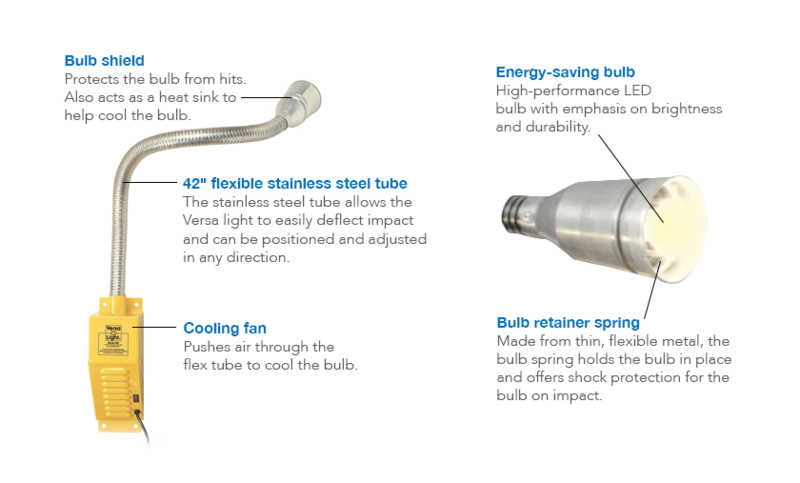 • Virtually no maintenance: A built-in fan cools the Versa light bulb, minimizing the chances of overheating. 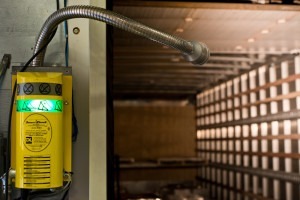 • Withstands impact: Versa lights are able to withstand multiple hits from overhead doors. • Flexible: Versa light easily flexes to any angle and maintains its position. 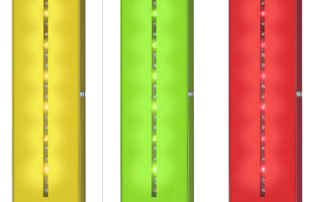 • Energy-efficient: These dock lights operate on low voltage and uses LED lights for minimal energy consumption. 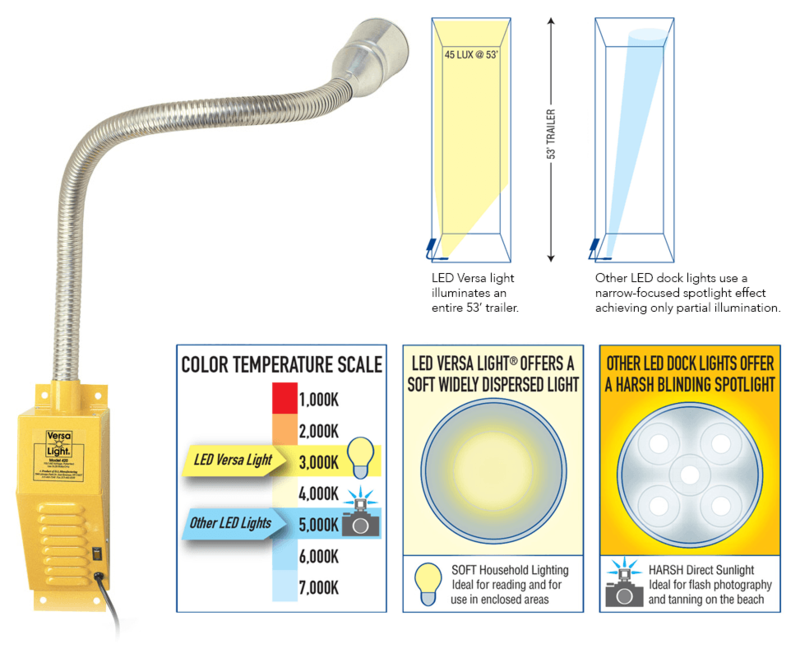 • Comfortable: High performance bulb in the Versa dock light delivers a bright light that is easy on the eyes. 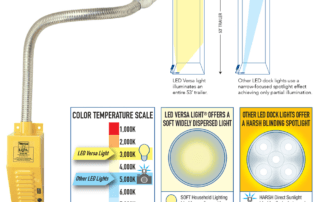 Click on the image to compare the Versa light against its competitors. 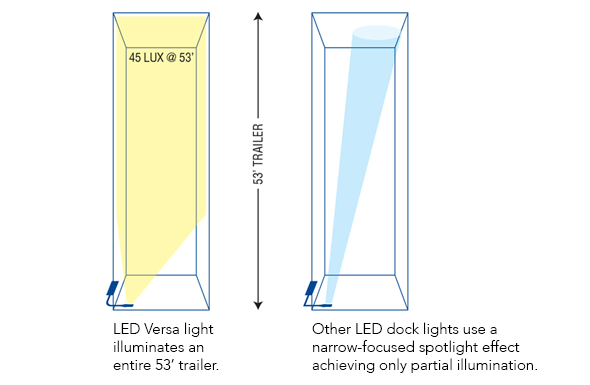 Click on the image to see the difference the LED Versa dock light makes when fully illuminating a large 53′ trailer. 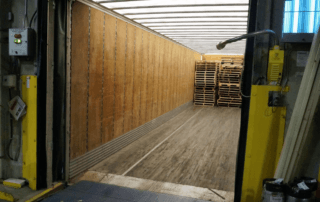 Other dock lights on the market use spotlight effects to only partially illuminate the backside of trailers. 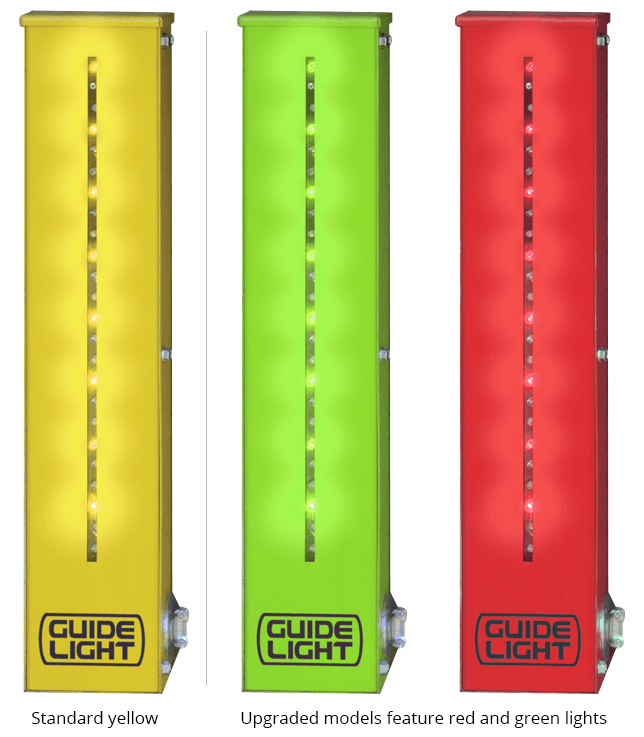 The Guide Light model provides a unique enhanced safety mode by activating red and green lights (compared to standard yellow guide lights). 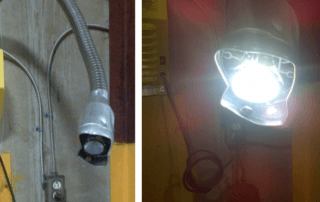 The LED Versa dock light successfully illuminates the inside of a 53' trailer. 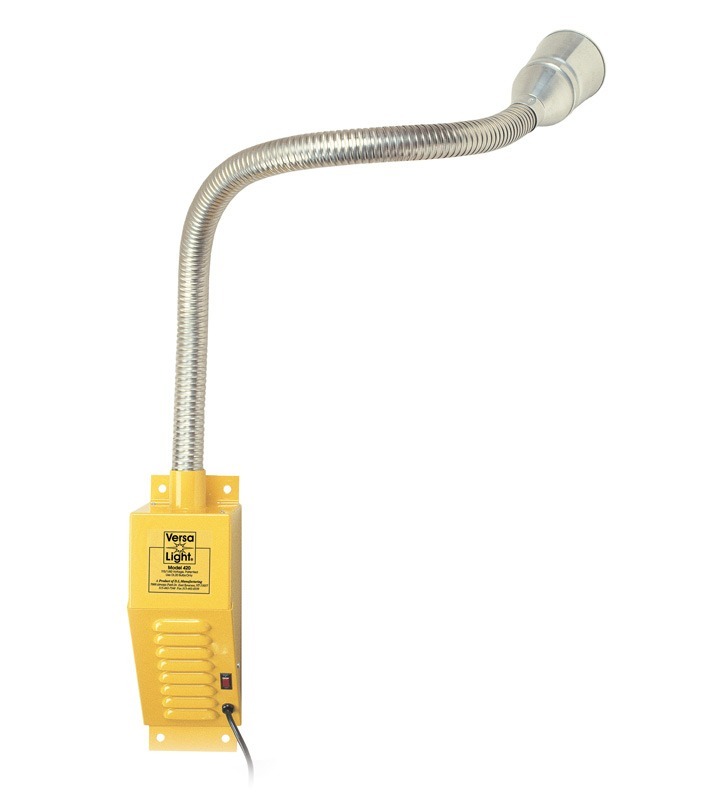 Its flexible tube resists overhead door impact while an in-built fan allows for airflow to cool its bulb and is easily positioned. 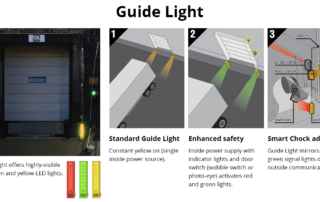 Installing Guide Light helps drivers line up challenging tractor trailers in bad weather or during urgent loads and maximize loading dock productivity. 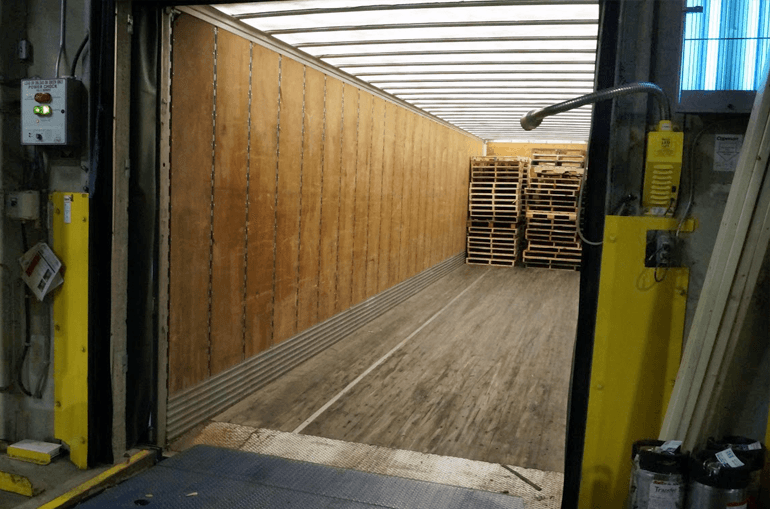 Misaligning a trailer leads to easier wear and tear on your dock seal and causes potential building, dock bumper, dock leveler or equipment damage. 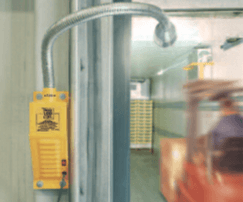 The LED trailer indicator light integrates with products including vehicle restraints, dock doors and trailers to signal drivers if the trailer is securely locked. 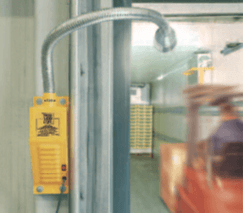 Logi-Smart control panels provide a single source of control for dock levelers, vehicle restraints, safety gates, overhead doors, and dock lights. • 50 Hz frequency available. 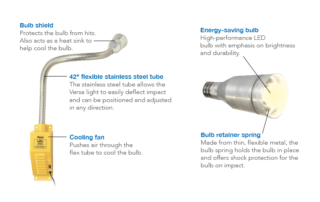 • 75% extended bulb life. 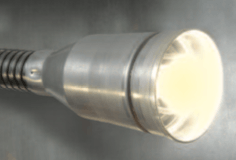 • Coated food service grade bulb. 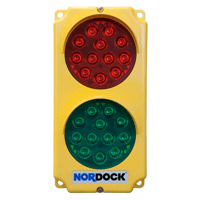 • Enhanced safety model includes red and green indicator lights. 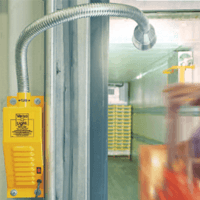 • Pair with Smart Chock for a complete dock communication solution. • Disconnects LED lights, dock lights and fans, 120V supply. 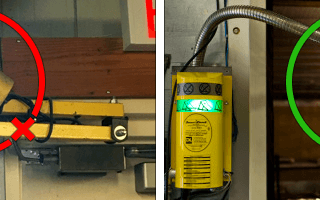 • Logi-Smart integrated control panel for safe integration of communication lights, dock leveler, door and vehicle restraint with full pre-wired interlocks and optional fused disconnect. 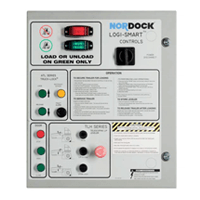 • Control panel with dock leveler and door interlocks with operator load function for leveler and inside green light control. 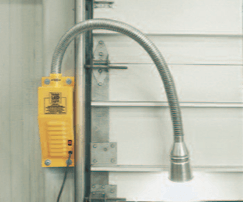 • Door or leveler mounted photo eye sensor or limit switch for automatic light control. 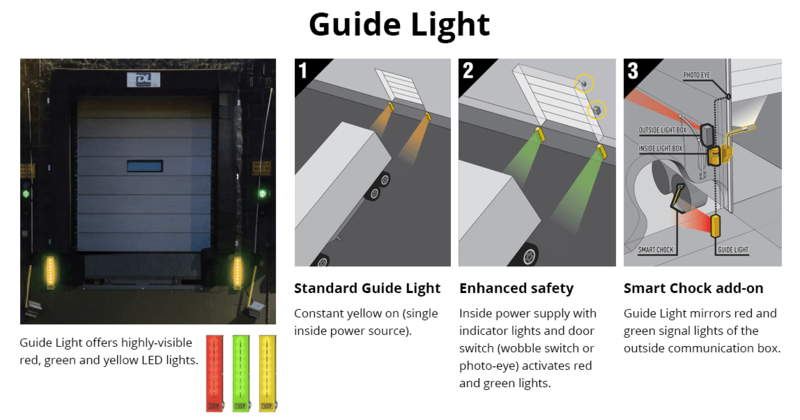 • Complete package includes high visibility signage with forward and reverse instructions. 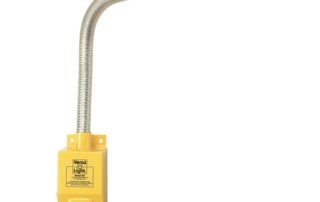 Metal flex tube length 42"